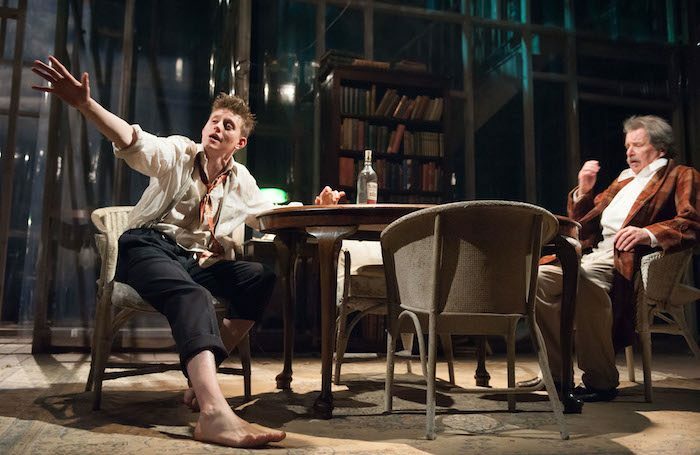 Eugene O’Neill’s script is torn between a tragic examination of familial conflict, realistic representation of drug and alcohol abuse, O’Neill’s need to demonstrate his awareness of theatrical changes in fashion, and a melodramatic meditation on how evil corrupts. This is ideal material for Dominic Hill: his direction eschews his usual scenographic signatures for a stunning and static set, and the ensemble flicker between melodramatic, gestural performances and more subdued naturalism. Hill’s style usually incorporates aspects from different dramaturgical eras, but here he emphasises the text’s own tensions, building slowly to a fierce, bleak conclusion. This unfortunately leads to a slow first half: the measured pace reaches intensity in the last hour as the roots of the family battles are exposed, through alcohol and desperation. Sam Philips (as James Tyrone Jr) embodies an alcoholic bitterness that ultimately reveals a vicious evil, while George Costigan and Brid Ni Neachtain (as Tyrone’s wife, Mary), despite the depth of their characters, offer melodramatic performances. The weakness of O’Neill’s script – that it never quite settles into any mode, but lurches between the subtle and the overblown – undermine the characterisation, but Hill guides his ensemble towards an emotionally gruelling finale. Philips’ James Jr becomes the villain, his alcoholic mode swings a recognisable horror for contemporary Glasgow. Mary’s obsession with home and respectability are a painful counterpoint to her addiction. Hill’s willingness to take on this famous script and place his and the cast’s talents at its service gives a bold yet reverent reading of an important moment in theatre.